The Sikh Center of San Antonio is the oldest Gurdwara, Sikh house of worship, in San Antonio. We are a registered non-profit organization, founded in 2001. The Sikh Center of San Antonio is dedicated to the spiritual and educational growth and support of our local Sikh community. We are founded on the principles of Sikhi, Seva and Simran and open our doors to all regardless of faith. With a focus on youth and participating in activities within the larger San Antonio community, we are committed to practicing the values bestowed upon us through education and engagement. The Nishaan Sahib located outside our building helps to identify our house of worship and reflects our commitment to help anyone in need. Due to our unique geographical location in South Texas, our Gurdwara often provides shelter, food and clothing to new immigrants who are transitioning into the United States and through this work we are able to practice Guru Nanak’s teachings. Sikhism is the world’s fifth largest religion and the United States is now home to over 500,000 Sikhs. 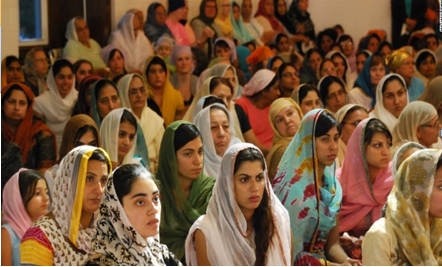 The Gurdwara is the center of the community – it is a place where individuals come to worship and learn. The Gurdwara, literally meaning the gateway to the guru, is accessible to anyone in quest of spiritual and religious progress and interested in kirtan (singing of hymns) and the teachings of Sikhism (or Sikhi). It is a place of worship designated for holding discourses on Gurbani and Sikh doctrines and performing kirtan in the presence of the Guru Granth Sahib (the sacred Scripture). Although the Gurdwara is often open during the week, our services are typically held on Sundays from 10am-1pm. Services are following by Langar, which is a free vegetarian meal shared together as a community. Everyone is welcome and donations are accepted. 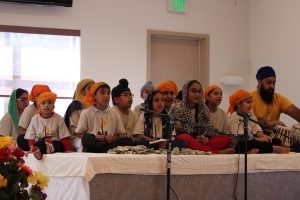 Learn more about the Sikh faith, identity and community in our Resources section. Please dress appropriately so that you may feel comfortable sitting on a carpeted floor. Clothing which covers most of your body, is suggested. No shoes are allowed in the main area. Please cover your heads when you are in the main Gurdwara area. Scarves are provided but you are welcome to bring your own too. A bench is provided in the main hall where services take place and in dining hall. These areas are reserved for anyone who may have difficulty sitting on the floor due to medical conditions. Please keep interruptions in the main hall where services take place to a minimum, and place cell phones on silent or off modes. No smoking is allowed anywhere on the Gurdwara premises at any time. Visitors under the influence of alcohol or drugs are not allowed on the Gurdwara premises. No weapons, other than the sacred kirpan (ceremonial sword), are allowed on the Gurdwara premises. When entering the main hall, you will see Sikhs bow to the Guru Granth Sahib, our sacred scriptures, and leave a monetary contribution before sitting with the congregation. You are invited to follow this process but you are not required to do so. Usually men sit on one side and women on the other. However, if you choose to sit with your family, it is acceptable. The religious service is followed by langar (free community kitchen) in the Langar Hall, or dining hall. Please help us in keeping the Gurdwara clean and respectable by not littering on the premises. If you have any questions, feel free to ask any Sikh representative in the congregation at the end of the service.